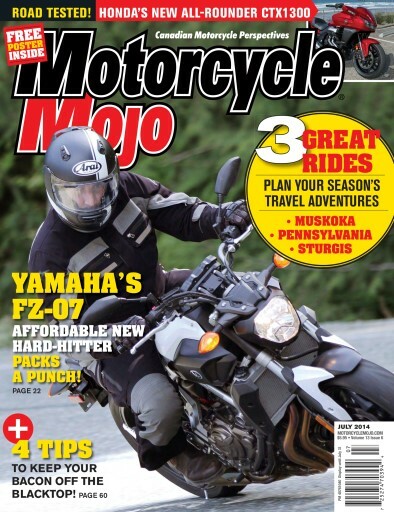 July’s issue of Motorcycle Mojo features two all new bikes from Japan: Yamaha’s newest middleweight naked, the FZ-07 and Honda’s all-rounder CTX1300. We’ll also take a history lesson with a beautifully restored 1899 Orient Autogo Trike as well as visit with a unique bike builder and his vintage Triumph. We ride along with John Howley on his first visit to Sturgis Bike Week, as he explores the roads that are the real headline in South Dakota and Ron Keys traverses Pennsylvania’s Wilds on the Grand Army of the Republic Highway.